Homegroups are such an important part of our shared life together as a chance to build deeper relationships with each other and with God . We have five groups that meet across Islington on wednesday nights in each other’s homes, and usually involve a shared meal, prayer, Bible study and good conversation. We have put together a simple pattern of Evening prayer with readings and silence for home groups. You can find it here. This Spring our studies are on the theme of Hope, reflecting on the implications of the Easter story upon the whole of creation. We have sourced some excellent video material by the great Tom Wright and you can pick up copies from church. The first week’s study is below. Open the study time with prayer. 1) How might living with the assurance of resurrection move us to action to bring hope in the world where we live today? 2) Where are the places in your community where hope is in short supply? 3) Ask someone to read each of the following passages and discuss how they challenge conventional views of Judgment and eternal life? 4) In the sermon on the mount Jesus teaches his disciples to pray “Our Father in heaven, hallowed be your name, your kingdom come, your will be done on earth as it is in heaven”. What do you think Jesus is asking us to pray, and how does this connect with the hope God wants us to bring to this world. 5) The early church was forced to decide if they would follow the existing power structures in the world, or God’s way and his kingdom vision. How might next week look different if you embraced a ‘God’s Kingdom come’ approach to living? 6) What are some of the ways that the Church has brought pain and heartache to the world. 7) How has the church served and loved the world in a way which has brought healing, grace and hope? 8) How should we celebrate these things and continue this legacy. Ask God to help you live with confidence that his hope is yours, now and forever. Pray for the Spirit to move you as a group and a church with actions of love and hope that reveal the presence of God. Discussion. When you think of people being resurrected somehow, how do you picture this in your mind. People tend to say traditional things at a graveside – they tend to go back to what they were told when they were young. Why do people say things at a funeral which they don’t seem to believe the rest of the time. The distinct and varied accounts of the Resurrection in the four gospels – how do they affect your sense of the authenticity of these events? What is the significance of the women being the first witnesses of the resurrection. Read John 20:19-20 When Christ is raised he appears to be both familiar and yet altogether different. How is Jesus Different after the resurrection? If it were really true, how would the resurrection empower us to live in new ways in the world today? In ancient Palestine water was a life and death issue. God gives us ‘living water’ not just for ourself, but for the sake of others. What does living water mean? What are some of the ways that you can bring refreshing new life to the world you inhabit? 1. How would your view of the world be different if you believed that heaven overlapped with earth, and could come into contact at any point? 2. The Sovereignty of Jesus was not exercise with displays of military or political power, but by love, service and humility. How should this shape the way we act in places where we have influence? 3. Jesus sent his disciples out to do the things that he had been doing. Sit quietly and write down one thing that you know Jesus is calling you to begin doing. Thank God that Jesus is risen and alive today. Give thanks for some of the people who have been living water to you. Pray for power to be a taste of the resurrected prescence of Jesus in the coming week. Pray for Church to be a body of people who live out the implications of the resurrection bringing new life, beauty and creativity to the world around us. Activity. If you have time during the week, visit an old churchyard and look at the theology which is being expressed on the tombstones. In the stillness ask God to make your life a testament to the hope of eternity. Discussion. 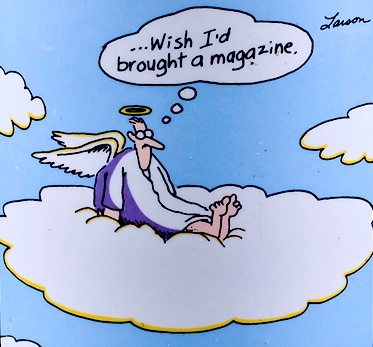 Talk about some of the pictures of heaven that are part of our cultural consciousness. What are the obvious problems with many of these? 1. How might seeing heaven as a place very far away and a reality quite separate from us have a harmful impact on the way we relate to God. 2. Wright suggests that in the Bible Heaven and Earth are are not wholly separate, but rather they overlap. Do you have experience of times when the presence of God was very near to you? 3. The question of Heaven also raises to question of hell. In what ways do we need to be very careful in talking about Hell? A review of the Book ‘Surprised by Hope’ had the mistaken title “Bishop abolishes heaven and the Soul” Can you suggest why this mistake was made? Read 1 Corinthians 15:50-54. There is a common view that everyone has an immortal soul. Discuss this in the light of these verses. Thank God that eternity will be vibrant, alive, dynamic and more interesting than we can dream. Give praise to Jesus for permanently connecting heaven and earth through his resurrection. Pray that you will see and experience how heaven is breaking into this life, and how God is sovereign and in control of this world, even when things seem troubling and confusing. Activity. In the week ahead plan to attend a church service, perhaps one different to the one you would usually attend, and stay in church for some time afterwards thinking about how the worship showed heaven and earth coming together. Look around the worship space and identify structures, symbls and objects that help you picture how heaven is very near. Session 4 The hope of Jesus Second coming. Eschatology means “the study of the last things” – not just Death and Judgment, Heaven and Hell, but the belief that history is under the guidance of God and will ultimately be brought to fulfilment by Him. Discuss – The end of the world is a favorite subject both of hollywood movies and religious leaders. Talk about some of the theories of the End Times (Christian or otherwise) that you have heard about. The Apostles Creed states that ‘Jesus will come again to judge the living and the dead’. What do you think that means? Read Acts 1:9-11. 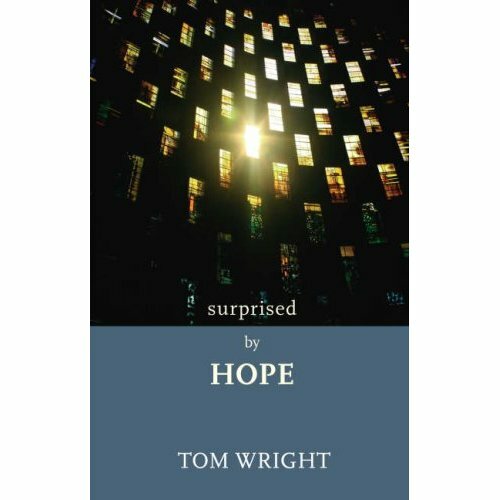 Tom Wright says “If we don’t hold on to the belief in the Second Coming of Jesus, we have not rounded out the whole Kingdom of God theology”. What do we lose if we do not have confidence in the second coming of Jesus? Read Philippians 3:20-21. How does this view of Judgment contrast to images of Judgement that we have been taught? What are the political and social implications of our theology of the second coming? Roman citizens who lived far from the city of Rome brought the heart, vision and life of Rome wherever they were. What does it mean for us to bring the culture of Heaven to where we are? What are some of ‘Heavens Agendas’ that God wants to weave into the fabric of this world that you can participate in this week? That you will live with sober awareness of the return of Christ. For stregth to care for the world that Jesus loves and will return to rescue and restore. For humble hearts to hold graciously when we find our theology of secondary issues (like eschatology) in conflict with others. Celebrate that the victory of Jesus won on the Cross will one day be seen in all the earth. Gardens are one of the ways that we bring order and beauty to the often chaotic world that we live in. Look up some of the Guerilla Gardening project that have taken place around London and see if there is anywhere that you could bless your community in this way?